“Out of sight, out of mind.” That’s most people’s’ relationships to both plastic pollution and waste, in general. 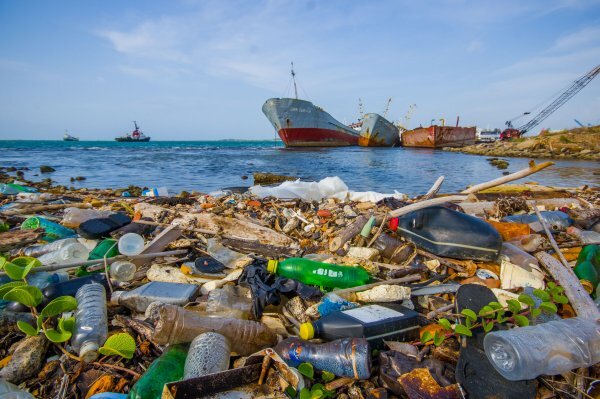 After tossing a plastic container or a cardboard box into the trash, they go about their day, ignorant of the fact that 85% of “garbage” dumped into landfills ends up in the oceans. As a result of mentalities such as this, hoards of pollution end up swirling in great convergences in the ocean – the largest, known as the Great Pacific Garbage Patch, is 2x the size of Texas – or, in some instances, stranded on islands. Such is the case with Henderson Island, one of the world’s most remote islands and, one of the most polluted. According to a study conducted by the University of Tasmania, the island’s beaches are polluted with around 671 pieces of trash per 10 square feet. This is astounding, considering no humans live on the island. As Inhabitat reports, Henderson Island, which is part of the Pitcairn Islands that are British territories in the southern Pacific, is 3,106 miles away from the closest major population center. For research purposes, humans only visit the island once every five to 10 years. When they do arrive, they are continuously surprised by the amount of garbage present. Indeed,, the island is home to the highest density of plastic debris found anywhere on Earth. Most of the trash that ends up on the island’s shores is from South America, due to the South Pacific Gyre ocean current. When Jennifer Lavers of the university and Alexander bond with the Royal Society for the Protection of Birds visited the island, they found an estimated 37.7 million pieces of plastic on the remote island. The research was published in the journal Proceedings of the National Academy of Sciences of the United States of America. Lavers told The Guardian that she’s seen plastic pollution around the world but was still dumbfounded by the amount found on Henderson Island. The researcher estimates that 3,570 new pieces of trash wash up on Henderson Island every single day on just one of the island’s beaches. At least 17 metric tons of plastic have been deposited on the island’s five different sites. As a result of the pollution, approximately 55% of seabirds are at risk. This coincides with findings from a previous study that suggests by 2050, 99% of birds will have plastic in their guts.
? If 11×11=4 And 22×22=16, What Is 33×33? Jaques Fresco, Founder Of The Venus Project, Dies Aged 101 ?